Hello, hello! Oh my, it has been a long time (two years) since I hosted a giveaway. 🤦🏻‍♀️ Fret not, I'm back!!! I'm so excited with the blog, finally it will have a much needed makeover...new header, etc. Can't wait. (I do hope I still would know how to plug them in). Haha. Anyhow, without further ado. Here goes. Entry submission will end May 20, 2017, Local Time (Philippines). Wow!!! This is awesome giveaway!!! I'm trying my luck. I am your new follower, but best of luck.. God bless!!!! Thank you for giving me a chance to win this awesome prizes. This will be the prefect mothers day gift for me if I won. Yes Im already a mother. God bless . Hoping that you have more prizes so that you can lauch more giveaways. Congratulatiins to your blog it really helps me to convince myself that im still beautiful though I have a kid already. Thank you! Joined sis. Thank you so much sa opportunity na ito. God bless and more power. Than you for giving me a chance to win this amazing items. This would be the best gift for me if I won. :) keep up the good work. Hi Happy mothers to ur mother! Yay! 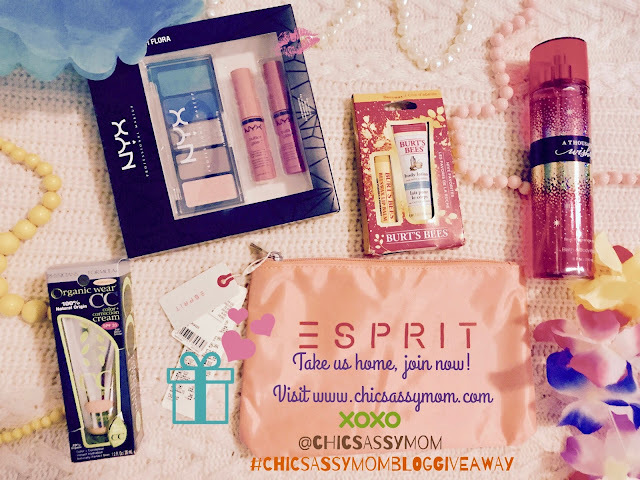 Thank you Ms Chic Sassy!